Sector 3 Eastern District at the top of the list. The Executive Inn on Pulaski Hwy. I've seen Pimps, Prostitutes, Drug Dealers, Junkies and degenerates of every stripe there. Two things you'll never find at The Executive Inn...an Executive, and a good nights sleep! 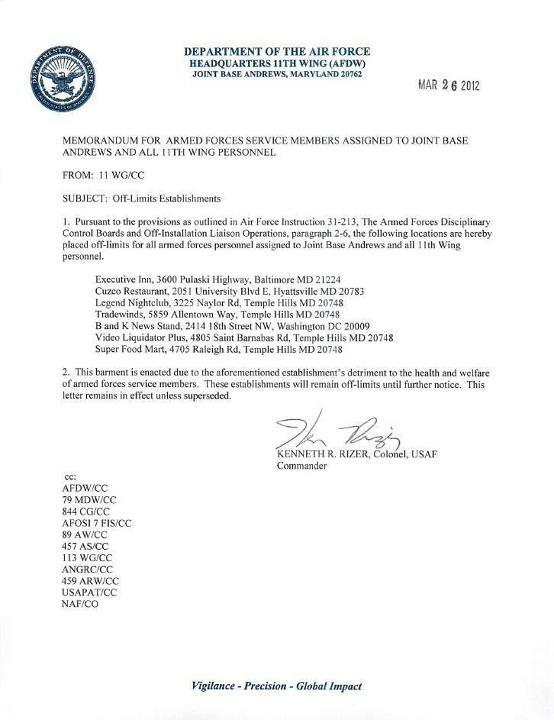 I can't blame the Air Force not wanting their personnel to go to The Executive Inn. I had the same experience as you in Sector 3 and they obviously cater to the criminal element. What else do you expect from a hotel that rents by the hour? You think someone gets a good night's sleep in an hour? ha! I don't think the Air Force, Army, Marines, and Navy, even all together, could handle the Executive Inn during a Signal 13 like we did. I'm just surprised 1) they're still in business, and 2) it makes the top-seven list! I guess #2 doesn't really surprise me. I didn't know they rented by the hour. Funny that you do.